You would rather drive me to madness than break some mere human law? In the context of a literary education dominated by Jane Austen (English all-girls prep school - rolls eyes), Jane Eyre felt radical - a proto-feminist tract in the form of a gothic-romantic novel. Charlotte Bronte presented us with a mid-nineteenth century heroine that was plain and poor, rather than pretty and middle-class. A heroine with a strong morality but who rejects both the piety of Mr Brocklehurst and the Christian "cheek-turning" martyrdom of Helen Burns. A heroine that attracted her lover, Edward Rochester, with moral and intellectual strength rather than sparkling wit. A heroine that rejected that same brooding Byronic hero to protect her moral autonomy and sense of self. A heroine who, even in the very depths of desperation and poverty, was never a "damsel in distress" to be rescued by her cousin, St John Rivers. Charlotte Bronte's Jane Eyre is morally and intellectual tough, but never a prig (in the way that Austen's Fanny Price can be), and her happiness resides in finding a man who with whom she can be herself - who gives her permission to be herself - the ultimate philosophical emancipation. And whereas so many romantic novels end abruptly with a marriage, Jane Eyre ends with a resolute declaration and the readers belief that, yes, this really is a marriage of equals that will last. Despite my great respect for the novel, I feel that it lends itself less easily to screen adaptation that the sparkling novels of Austen. Gothic tales, if mis-handled, can seem melodramatic and ridiculous. And then there are those few episodes which stretch credulity on the page, and look absurd on screen. How should a modern audience react to the sight of Edward Rochester dressing up as a gypsy woman to read Jane's fortune? How will they react to the absurd coincidence that St John Rivers is Jane's cousin? And how far will Hollywood have the courage to cast a hero and heroine that really are plain and Byronically ugly respectively? To my mind, the most successful adaptations have been the 1944 JANE EYRE with a truly frightening and Bryonic Orson Welles as Rochester, and a script by John Houseman and Aldous Huxley. The only negative was the altogether too pretty and insipid Joan Fontaine as Jane. After that, I very much liked the 1996 Franco Zefirelli JANE EYRE starring a good-looking but suitably old and menacing William Hurt as Rochester and the absolutely perfect Jane in the jolie-laide Charlotte Gainsbourg. Both of these adaptations retained the gothic, dark atmosphere of the novel and showed the struggle between passion and morality. Both are memorable and definitive in their own way. 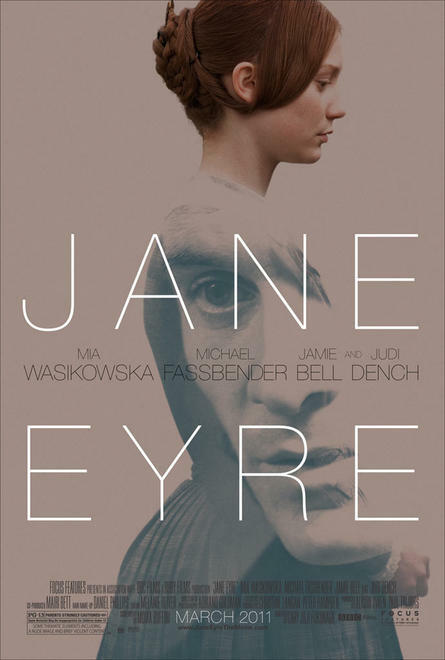 The new adaptation of JANE EYRE from director Cary Fukunage (SIN NOMBRE) and screenwriter Moira Buffini (TAMARA DREWE) has its moments but must, overall, be judged a failure. And for that, I blame the writer and director. Buffini's screenplay is admirably concise; uses an effective flashback structure; and thankfully omits all episodes that force a willing suspension of disbelief that strains the modern viewer. (No gypsy and the Rivers aren't cousins). But, Buffini also compresses Jane's early years so radically that we do not get a sense of how she came to be the remarkably self-possessed, morally upright woman that Rochester falls in love with. The Red Room is shorn of its Gothic visions; the death of Helen Burns is dealt with in a matter of minutes; and most importantly, the good example of Miss Temple, the kind teacher who forms so much of Jane's character, is omitted entirely. And so, after a few short episodes, we go to Thornfield and see, almost as quickly as we rush through Jane's childhood, Rochester and Jane falling in love. Admittedly, once we get to that point, the love story plays out beautifully, because Buffini finally gives the story room to breathe, and Mia Wasikowska and Michael Fassbender (though both far too beautiful) finally get the chance to show what fine actors they are. But as the story develops into its dramatic climax, the movie and the script absolutely fails. For Buffini and Fukunaga have taken the decision to focus on the romance, the intellectual and emotional inter-play, at the expense of the Gothic. There is no "woman at the foot of the bed", no "tearing of the veil"...It's as though they are embarrassed by it, or unwilling to keep faith with Eyre's vision. Indeed, they are so embarrassed by the generally brooding and serious tone of the novel, that they feel it necessary to make Judi Dench's Mrs Fairfax comic relief - pathetic. And so we are left with a very beautifully acted and wonderfully photographed (DP Adriano Goldman) love story yes - and with no little power - the scene where Rochester begs Jane to stay is quite wonderful. But this is not Jane Eyre, not really. The proto-feminism is there - the Victorian romance is there - but the Gothic is cruelly, disastrously under-played. JANE EYRE was released earlier this year in the US, Estonia, Latvia, Taiwan, Portugal, South Korea, Iceland, South Africa, Singapore, Israel, Kuwait and the Czech Republic. It is currently on release in Hong Kong and Russia. It opens on September 9th in Belgium, France, Ireland and the UK. It opens on September 16th in Sweden; on September 22nd in the Netherlands; on December 1st in Germany; on December 9th in Turkey and on February 23rd 2012 in Denmark. I went to watch this having never read the classic (call me a literary philistine, go on) and found it to be a failure for about the same reasons as you did. It just turns to lead the further it goes. And the final exposé had all the panache of a street-play. Dench's character and acting was a total washout. But yes Mia and Michael play each other off wonderfully and my fanship for former lassie continues. All that assuredness and latent pain & all nuances in between: she's a vision on the screen. Whatever little I know of the book, she nails it right from the first scene and I yearned to know this character more. Glad to know that the book offers more. Seeing it tonight, so will withhold judgement. For me though, only a much longer experience can do the book justice - hence the relative success of the 2006 TV series, with a suitably rough Rochester and fairly fuggers Jane. Therefore, not expecting much from this adaptation - but it would be a shame if they've lost the darkness of the novel, and tried to inject lite comic touches, that would be awful.